Write On New Jersey | Tag Archive | E! 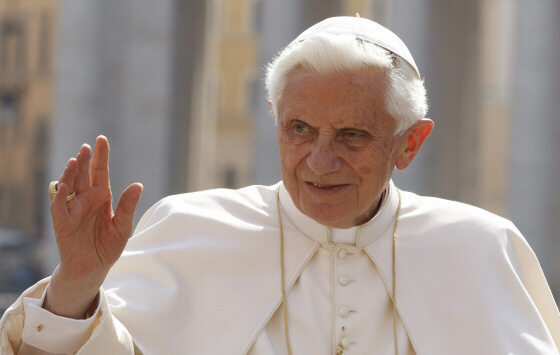 With a few Latin words, Pope Benedict XVI did what no Pope has done in almost 600 years – abdicate the Papacy! His announcement sent shockwaves around the globe and sent the world atwitter (all puns intended) with speculation as to the reason for his sudden announcement and departure. Most people who give notice to their employers leave to accept a better opportunity. Although the Pope did not indicate his plans (perhaps he could not fully express them in Latin), my money is on reality television. Recently, an anonymous source indicated to me that several cable networks had made handsome offers to his Holiness for reality TV shows. truTV has allegedly offered the Pope a leading role in a reality program starring his Holiness and a retired Hindu master. Dubbed Holy Cow!, the show will air on Sundays and feature lively banter between the Pontiff and his Hindu foil on subjects such as God, Eternity, Heaven, reincarnation, and the comparative popularity of sitar music versus Gregorian chants. Not to be outdone, however, E! Network is also seeking the Pope’s services. With the demise of The Girls Next Door, E! network is seeking new programming, and the Pope’s resignation may be just the ticket to create a reality television megahit. Teaming Hugh Hefner with the Pontiff, The Pope Next Door will be a buddy list reality comedy enabling his Holiness to demonstrate his lighter side. Whether worshipping the sun in Honolulu or cruising for snow bunnies in Aspen, the Pope and Hef are sure to delight their viewers. If contract talks with Hugh Hefner stall, E! has a backup plan, employing the Pope to replace Bruce Jenner on Keeping Up with the Kardashians. Of course, in all seriousness, I am certain that the Pope’s decision has the best interests of all Roman Catholics at heart and fear that it is based on some debilitating mental or physical illness. Yet, if he wanted, he could be bigger than Honey Boo Boo!